In the last 20 years, India has come a long way in terms of it’s technological progress. From becoming the numero uno sourcing destination for IT services to launching 104 satellites at one go, the country is progressing in leaps and bounds. To ensure that this technological progress remains on a steady track, the current Indian dispensation led by Prime Minister Narendra Modi has taken some stellar initiatives in the technology domain. 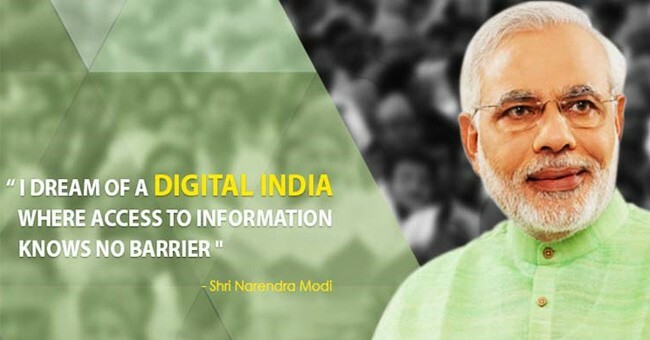 The ‘Digital India’ scheme was launched on 1st of July, 2015. The aim of the scheme is to ensure that all citizens have access to government services electronically and benefit from the latest IT technologies. The nodal agency implementing this scheme is the Ministry of Communications and Information Technology. Cashless India is a scheme that aims to promote cashless transactions in India. There has been increased focus on PoS (point of sale) machines, digital wallets and UPI based apps to facilitate easy cashless transactions such as BHIM App. Also to encourage cashless transactions, the government has rolled out schemes like “Lucky Grahak Yojana” where lucky customers transacting online get monetary rewards. Startup India is an initiative undertaken by the Government of India that aims to build an ecosystem where Startups are nurtured. This in turn, will boost economic growth and provide plenty of employment opportunities. To take the scheme forward, an Action Plan has been framed to tackle the wide-ranging aspects of such an ecosystem. It involves funding support, partnership between industry & academia and other simplification measures. Pradhan Mantri Kaushal Vikash Yojana (PMKVY) is a skill development scheme undertaken by the MSDE (Min. of Skill Development & Entrepreneurship). The aim of this scheme is to train the Indian youth on a wide variety of industrial relevant skills so that they can secure a better livelihood and contribute to the economic growth. The Smart Cities Mission is an initiative of the Indian Government to boost economic growth and enhance the living standards of a city’s residents. These objectives are meant to be met by harnessing technology to provide essential services to the people and helping economic growth by permitting local development. MUDRA or Micro Units Development & Refinery Agency Ltd. is an institution established by the Indian government. The aim of the institution is to provide business loans at reasonable rates. The loans under this scheme has been classified as Shishu, Kishore and Tarun. These loans are directed at Startups and other small organizations that are known as Micro units. The Bullet train initiative in India is being undertaken by the Indian Railways. It proposes to construct high-speed rail corridors between certain stretches. The first corridor will be the Mumbai-Ahmedabad line. The corridor will support trains moving at high speeds up to a maximum speed of 350 km/h. Launched by Prime Minister Narendra Modi in 2014, The Make in India initiative aims to transform India into a Global Manufacturing Hub. The initiative is aimed at boosting the domestic industry as well as attracting foreign investment. The government has prioritized 25 sectors for this campaign, some of which are Aviation, Pharmaceuticals, Construction and Electronic systems. The Digital Locker is a secured online personal storage facility released by the Dept. of Electronics & Information Technology. A citizen having an Aadhar card will be able to use DigiLocker. It allows you to store various documents like the Pan card, official documents and the Voter id card. Social Endeavor for Health and Telemedicine (SEHAT) is an initiative to connect various Common Service Centers across India on a common network. This will facilitate delivery of healthcare services irrespective of a patient’s location. This initiative has been undertaken in association with Apollo Hospitals.